The Gard Saxophone Wheelie Bag can be wheeled or carried as a backpack. 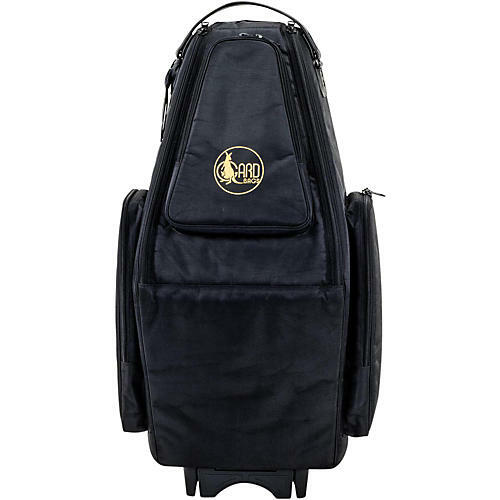 This versatile bag can configured to hold one or two of your favorite instruments. Adjustable foam pillows that let you create a secure custom fit for you instrument(s). A large front opening makes loading easy. The pull-up handle locks in six different lengths, and the bottom stand extends to prevent tipping over. Front pocket expands to hold accessories, and a net pocket is provided for cleaning towels. The Wheelie bag is made of durable synthetic material with leather trim.